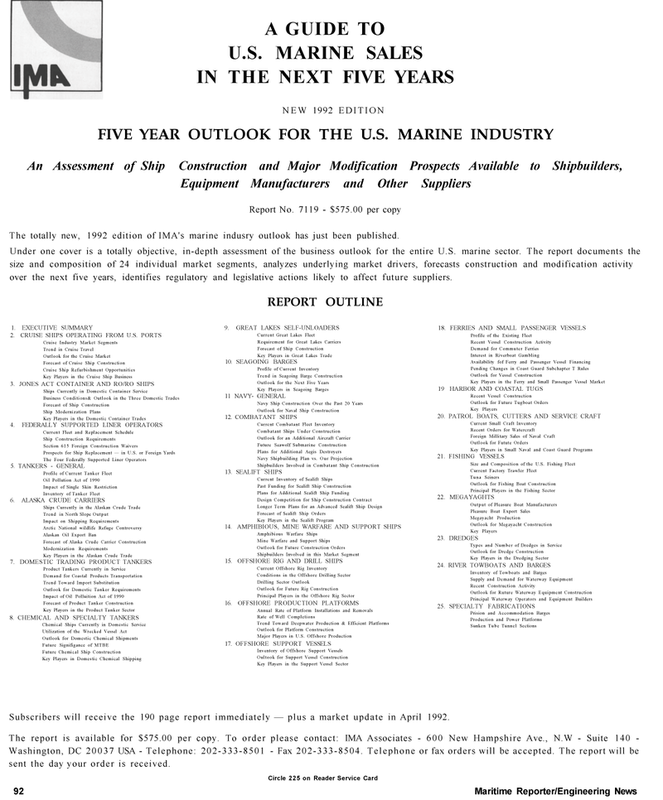 The totally new, 1992 edition of IMA's marine indusry outlook has just been published. Under one cover is a totally objective, in-depth assessment of the business outlook for the entire U.S. marine sector. The report documents the size and composition of 24 individual market segments, analyzes underlying market drivers, forecasts construction and modification activity over the next five years, identifies regulatory and legislative actions likely to affect future suppliers. Subscribers will receive the 190 page report immediately — plus a market update in April 1992. Washington, DC 20037 USA - Telephone: 202-333-8501 - Fax 202-333-8504. Telephone or fax orders will be accepted. The report will be sent the day your order is received.